Who doesn't want the barrel chest of a superhero? In the comics, a hero's chest demands respect and radiates power. Power pecs aren't easy to achieve without great genetics (or superpowers), but my routine and chest tips will help you build a breastplate chest like your favorite heroes. The pectoral muscles are particularly complex. Training them is a major bodybuilding puzzle only the world's greatest detective could solve. Isolating the chest is difficult because the shoulders and triceps often take over on big pressing movements. The triceps typically fatigue earlier than the pecs, making it hard to hit the chest to actual failure. Then there's the problem of genetics - people have different genetic proportions, like Clark Kent vs. Jimmy Olsen. A person with a lot of glycolytic (fast-twitch) muscle fibers in his chest will build pectoral mass easier than most. Some of us can build shoulders and arms, but can't add an inch to the chest. This has a lot to do with a person's quantity of slow-twitch chest fibers, though it also has to do with the strength of the deltoids, which tend to take over most chest lifts. Proper training and technique help you avoid that weight transfer. Knowing the problem is step one; learning how to correct it is step two. The pectoral muscles consist of two groups, the pectoralis major and the pectoralis minor. The major exists on the more superficial layer of the chest and is much larger. The pectoralis minor lies underneath the major and slightly lower on the chest. These two groups work together to move the arm. The pectoral group is primarily responsible for the forward and downward motion of the arm. The muscles allow a person to push something away (an intergalactic shoving match), or bring it across the body (like Thor's Mjölnir). 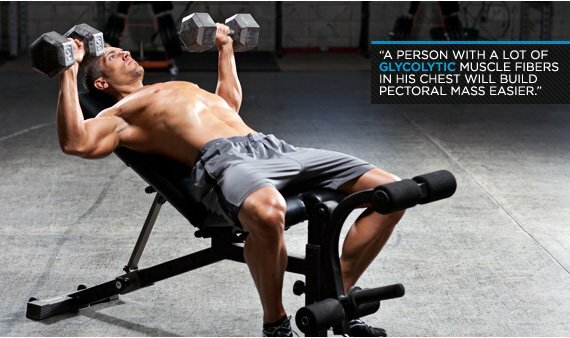 It is therefore important to repeat these types of movements in order to develop and grow your chest muscles. Tearing down your muscles should only take a short time. One of the best ways to rip up the pecs quickly is to work to muscle failure. When it comes to chest training, technique and approach are as important as exercise selection. Perform each set with precision form. Lower the weight slowly and with complete control; deliberately stop the weight 2-or-3 inches from touching or resting on the chest; hold that position and squeeze the chest muscle, while maintaining a full muscle contraction (muscle fibers firing); explode the weight upward to the start. Increase the weight for each set: Fail at between 8-to-10 reps on your first set, then between 6-to-8 reps. On the 3rd and 4th sets (using a spotter), max out on the 6th rep and add force reps to achieve complete failure. Correct breathing is needed to coordinate with the movement, especially on the explosive portion of each rep.